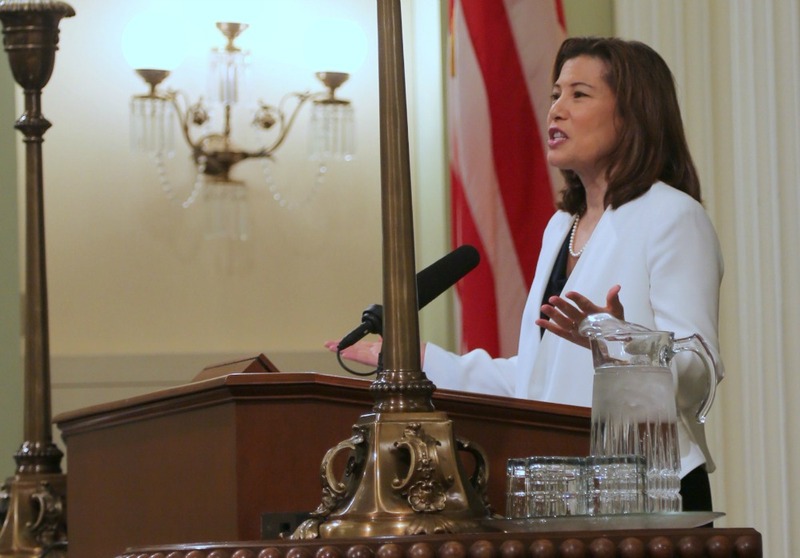 SAN FRANCISCO—A workgroup established by Chief Justice Tani G. Cantil-Sakauye to study California’s bail system issued a slate of recommendations on Tuesday, saying money bail should be replaced by a risk-based assessment and supervision program that determines whether to jail defendants before trial based on their threat to public safety and their likelihood of making a court appearance. The recommendations include replacing California’s current money bail system—which the group called “unsafe and unfair”—with a pretrial assessment that gathers information about each defendant, better arming judges with information about that person’s potential risk to the public. Pretrial programs would also give judges more tools to supervise defendants, such as drug testing, home confinement, and text reminders for court dates, the report said. 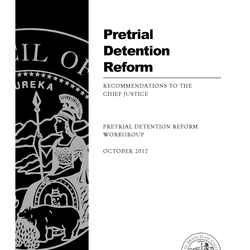 After calling for a review of the bail system during her 2016 State of the Judiciary address, Cantil-Sakauye established the Pretrial Detention Reform Workgroup in October 2016 to study the current system and to develop recommendations for reform. Several California counties—including Santa Clara, San Francisco, Ventura, Humboldt, Riverside, Imperial and Santa Cruz—have programs that provide risk assessment information to judges that helps them to decide, in a limited number of cases, which defendants can be safely released before trial. In recent years, New Jersey and New Mexico instituted sweeping reforms to limit or end money bail. For decades, Kentucky and Washington, D.C. have run systems that primarily rely on risk assessments with very limited use of money bail. 1. 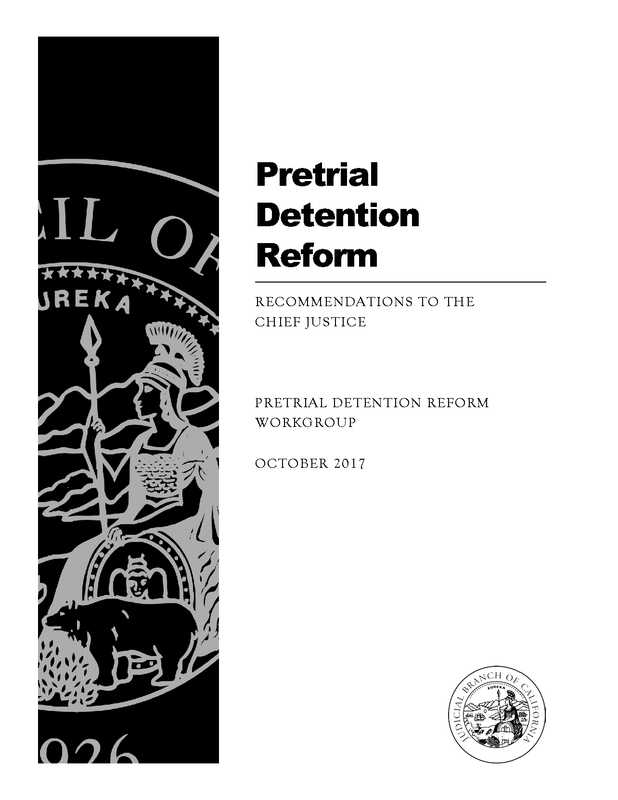 Implement a Robust Risk-Based Pretrial Assessment and Supervision System to Replace the Current Money Bail System: Courts would use a risk-based pretrial assessment system to gather information about each defendant for use in decisions on release or detention based on the defendant’s risk to public safety and whether the defendant is likely to return to court. 2. Expand the Use of Risk-Based Preventive Detention: In cases where no conditions of release could ensure public safety, judges must have the authority to detain defendants to protect the public, victims, and witnesses. 3. Establish Pretrial Services in Every County: Pretrial services—including use of a validated risk assessment tool—provide information to help courts to make decisions about whether a defendant should be released, as well as providing defendants with reminders of court dates and monitoring compliance with the conditions of release. 4. Use a Validated Pretrial Risk Assessment: These tools measure a person’s likelihood of returning to court or committing a new offense during pretrial release based on factors such as their history of failure to appear, prior convictions, current charge and age. Judicial officers remain the final authority in making release or detention decisions, while taking into account recommendations based on risk-assessment information. 5. Make Early Release and Detention Decisions: Decisions should be made at the earliest possible point in the pretrial process. Longer pretrial detentions disrupt defendants’ employment, families and communities, and are associated with the likelihood of new criminal activity for low-risk defendants. 6. Integrate Victim Rights into the System: All victims must have the opportunity to be heard and their comments considered, especially in cases involving intimate partner violence, child abuse, stalking and sexual assault. 7. Apply Pretrial Procedures to Violations of Community Supervision: When courts issue “no bail” arrest warrants for defendants who violate community supervision, a person cannot be released until their case is over. This significantly impacts limited jail resources. Legislation and rules of court must be adopted that consider pretrial release and detention screening procedures for those who violate the terms of their supervision. 8. Provide Adequate Funding and Resources: California’s courts and local justice system partners must be fully funded to effectively carry out a system of pretrial release and detention, including: resources for new judges and court staff, infrastructure for justice system partners and other agencies, assessment tools, and training. 9. Deliver Consistent and Comprehensive Education: Comprehensive and ongoing education is imperative, and a date for implementation must be set that provides courts and justice system partners enough time to undertake training and make reforms. 10. Adopt a New Framework of Legislation and Rules of Court to Implement these Recommendations: This system must be developed as a comprehensive whole, not grafted onto the current complex statutory framework of monetary bail.